that looks sooooooo good – I have yet to try the seitan cultlet recipe from Vcon – I shall be book marking this though – it all looks divine – great photo. it’s so beautiful I can totally see it being served at a fancy restaurant. Oh my gosh, that meal looks amazing! 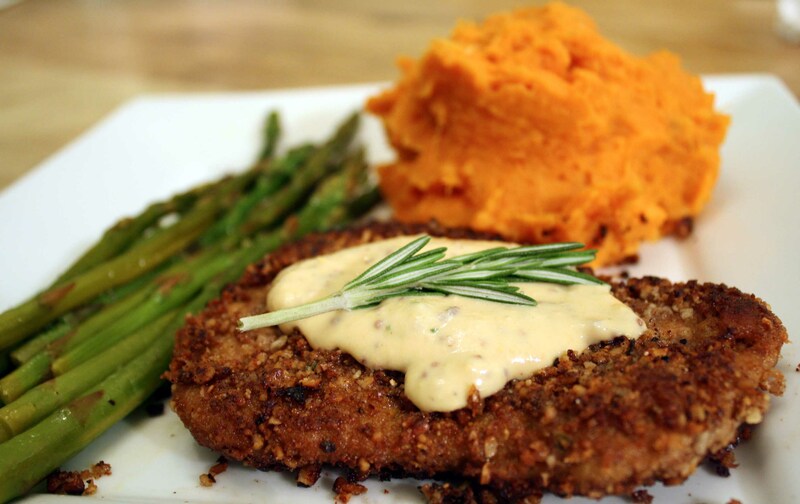 I’m going to have to try the pecan crust on the seitan soon–it looks delicious! I have everything to make that seitan recipe! Just need a free night to make the cutlets – and then I’m going to try it. It looks and sounds fantastic. I’m a sucker for anything “encrusted”. Well, any vegan protein “encrusted”. When I was eating this I felt like I was eating at a fancy restaurant too. Its something about apargus that seems fancy. You should definatly try the pecan crust, its awesome! That looks and sounds amazing. I wish I’d seen this yesterday when I was wondering what to do with my asparagus, but at least I’ll know for next time! And that pecan crust sounds WONDERFUL! This whole meal sounds really good! Mashed sweet potatoes is one of my favorites. Wow, this looks amazing and being the seitan addict I am, I’m going to have to try this!